CARLSBAD — Competitive cheerleading has become a costly sport for those looking to take their skills to the next level. It’s one reason why Michelle Altenhoff broke off and formed the Activ8 All Stars last year. And while the athletes jumped into something new, most have been with Altenhoff and trusted her talents. 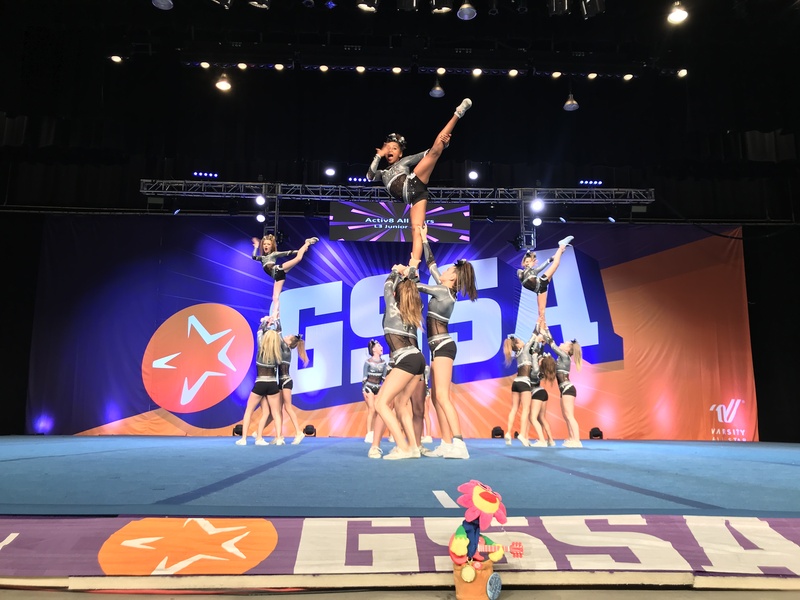 All the hard work paid dividends two weeks ago as the Activ8 Blackout, the gym’s top-level squad, placed fifth at the Golden State Spirit Association National Championship in Bakersfield. The squad put up a score of 96.54, which was less than one point away from the national title in the squad’s first national championship appearance. As a result, the squad secured two other invitations for national competitions — one from the Universal Cheer Association in Orlando, Florida, and the other for the U.S. Finals in May in Las Vegas. Altenhoff said the squad will not attend the competition in Florida as a way to avoid additional expenses, one reason she started the new team and found a new gym. Many of the big gyms run between a minimum of $10,000 to $20,000 per year for club dues and travel expenses, which makes up for most of the cost, Altenhoff said. So, as a way to encourage more athletes to participate, she knew costs had to come down. For her club, it was all about closer travel, keeping the team near the West Coast, and lower yearly dues. Her club costs about $6,500 per season. Two years ago, Altenhoff, with the push from parents, broke away from the Pop Warner league and went with Cal Coast All Stars, which she said were good experiences but wanted her own club. The team was practicing at the Activ8 gym in Carlsbad and the two entities formed a partnership last year. Activ8 trains all levels of athletes including those currently in the NFL, Major League Baseball and major college athletic programs, to name a few. The cheerleading arm, meanwhile, features three squads with an age range between 5 and 15 years old. And while Activ8 is newer, Altenhoff said the goal is not to become a large-scale operation. She will keep the club under 125 athletes and remain in Division II, under the Varsity Cheer umbrella. DII is bigger step up than what the team previously competed under, going against squads from Texas, Colorado and California, among others, at GSSA national competition. Also, she requires a ‘C’ average for all athletes to remain eligible, so those not in high school can be prepared for those athletic requirements.